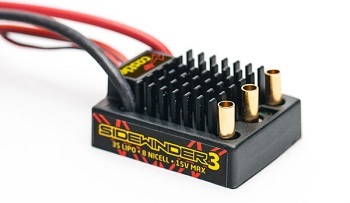 Retaining the astonishing retail price of $79.95 (ESC only), the Sidewinder 3 offers world class performance at an entry level price. Although Sv3 and Castle brushless motors are waterproof, always rinse the ESC and motor with fresh water after exposure to corrosives or dirt. While the motor and controller may be waterproof, we suggest users confirm that the rest of their vehicle, including the batteries, servo, radio and chassis, are also waterproof before exposing them to liquids of any kind. Product labeling and wiring may not match the images shown here. If you like this article, check out this additional article on Castle Creations. Just bought this same combo for my gmade crawler. Just wondering what programming i need to do for down hill drag ? I haven’t been in the game for a while lol so i dont really know how to set it up right so i dont fry the motor. Do you mean how to adjust the drag brake so you roll down hills easier?